Ready made EL Wire Kits are exactly what they sound like. Just pop in a battery or two, and you’re good to glow! EL Wire kits have been configured and pre-soldered, which means no special tools are required to glow. 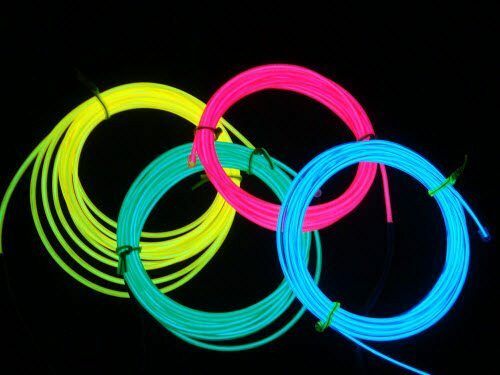 EL Wire kits are available in various lengths, and available in all 10 colors. EL Wire kits are great for Halloween costumes, decorating and many more applications. Portable EL Wire Kits are great for costumes, stage performances, biking, or anytime you want to glow on the go. No outlet required. These kits are perfect for festivals like Burning Man, Coachella, Sasquatch, Electric Daisy Carnival and more. Check out all the Portable EL Wire Kits below and select the one that works best for you. EL Wire Sport and Auto Kits are designed to be used with the 12V source of most cars today. They require no soldering, no special tools and can enhance the look of nearly any car. Great for car shows as well, EL Wire Kits provide an easy way of making your car glow. Just plug the adapters into any cigarette or 12V adapter and watch it glow. Portable EL Wire Kits are a great way to accent hallways, windows, buildings, pools and more. They require no special tools and have the ability to be plugged into any outlet. This “ready to go” el wire kit includes everything you’ll need to light up any custom project! EL Wire Kits comes with an attached battery pack that takes 2 AA batteries. Available in a wide assortment of color options, these EL Wire Kits are the single best option for an easily portable, completely bendable lighted wire accessory. Drape it, lace it, wrap it around and through anything, whether it’s you and your party costume or your outdoor nighttime bar. You can create unlimited patterns and motifs with the EL Wire Kits and mix and match colors for contrast or harmony — the sky is the limit! Effective and stunning not only as party decorations and accessories, EL Wire has plenty of practical functions as well. Take the EL Wire kits camping, or put one in your emergency kit to demarcate positions and locations with a bright string of glow. So go for it, create something magnificent! Each kit is unique with the products that come with the kit such as accessories for attaching the El Wire for its desired use. Some EL Wire Kits come with additional products that to make it a package deal. El Wire Kits are perfect for do-it-yourself projects, and a great way to save money. El Wire Kits can take a lot of guess work out of what type of wire, length, diameter, connections, & accessories you need to get you what you want.